19th and 20th of March. If you would like to only attend one day please do contact me and I will see if there is the space. Places are limited so that everyone has the chance to properly see the model. This weekend wi ll provide a chance to develop your understanding of portraiture. We will study the proportions and planes of the head using mannequins, photographs and a live model. Morning: Drawing with pencil or charcoal, looking at proportions and the planes of the head. How to show volume with light and shade. Afternoon: We will begin a painting or pastel from the model, using the method of simplifying planes of the head. Some time will be taken to consider colour relationships, flesh and background colour, how to mix with cross-hatching or on the the palette for oil painters. 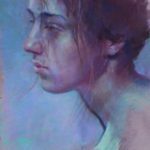 Morning : We will look at examples of portraits done by various artists and then create an painting/pastel from a photograph. Afternoon: Quick studies from life and then continuing the portrait which we started on Saturday with the same model posing. Please let me know if you need any advice or help finding your materials, I can provide some paper at cost price if I know in advance! The price of the course is 170€ for the 2 days, this includes lunch, model fees, studio equipment.